Having grown up in Johannesburg, I discovered the utter delight that is seafood, very late in life. That is often the case when you live inland. 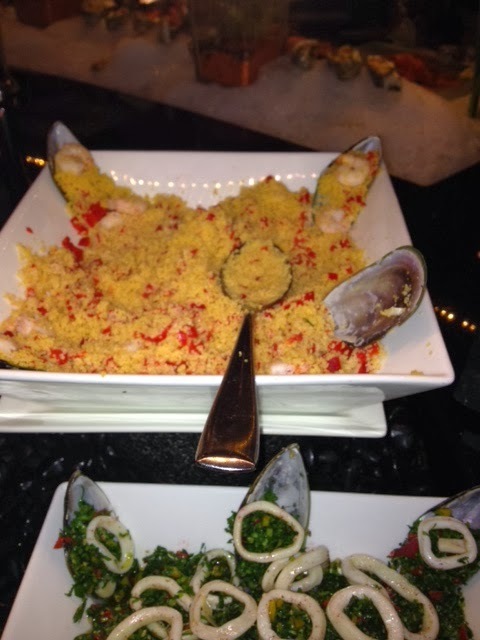 However, since moving to Abu Dhabi seafood has developed into one of my favourite food themes, if you will. Because quality seafood is expensive, one is likely to expect a smattering of shrimps, some mussels, oysters if you are lucky and finally, a few fishy grills. The rest of the dishes tend to be 'fillers' along international lines. 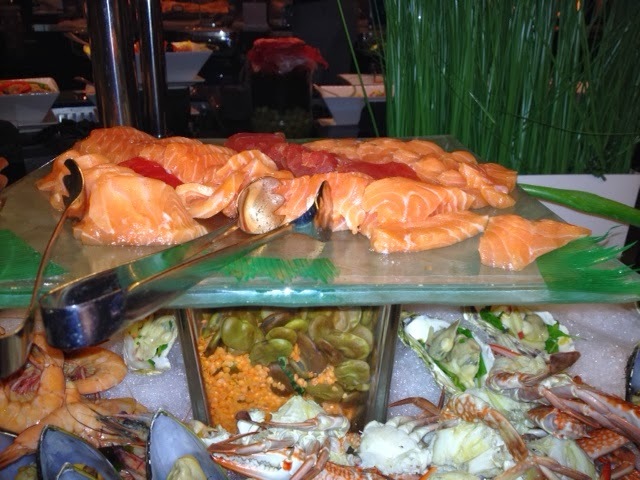 It was with this in mind, that I approached Seafood night at The Sofitel. However, it was the antithesis of what I expected. The first impression one has as one enters and sees decorative nets strategically placed is that this is indeed a seafood night. However, the decor is not kitschy. The seafood motif is continued more significantly, when one peruses the rest of the buffet. The seafood theme runs throughout. On a previous seafood night experience elsewhere, there were the ubiquitous seafood grill, sushi and sashimi selection and well, fish and nothing else significant in side dishes to maintain the theme. The rest of the substantial buffet was what I described above as 'international' fair. Why did my perusal of the buffet make such a good impression? Salad and starters keep the theme going. 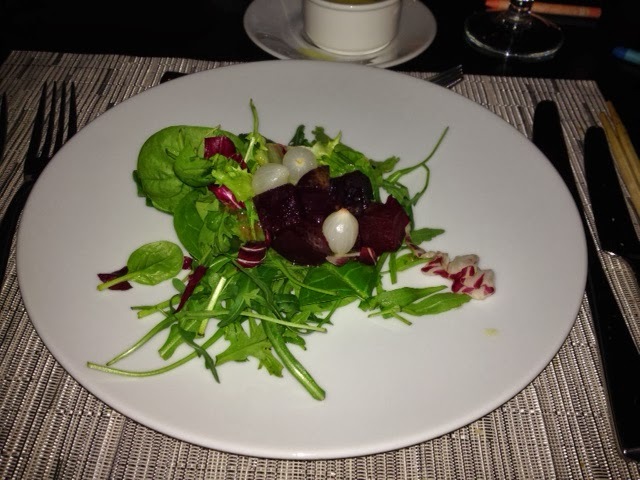 My favourite salad on the night with a beetroot theme. Firstly, the salad choices are substantial, with a healthy number of salads continuing the seafood theme: There were 2 different shrimp based salads, a couple of calamari salads, squid and a few other fishy options to make you feel it was areal seafood night. There was of course sushi and sashimi. 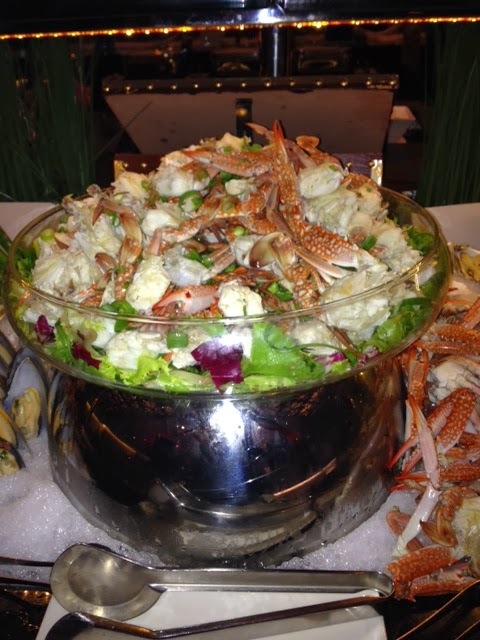 However, at the centre of the salad/starter station was a platter of local crab; it certainly had stand-out appeal. Adjacent to this area were the oysters, shucked live. 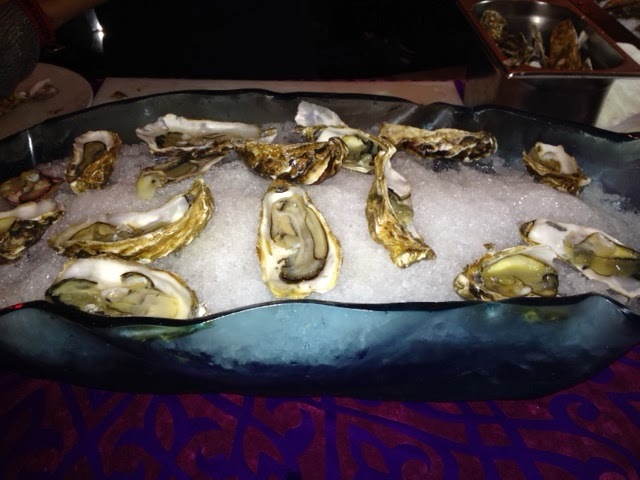 The shucking was done by one of the staff at their signature restaurant, La Mer. The grill station had fine Omani lobster, fish and octopus. That was not all. I also spotted paella. 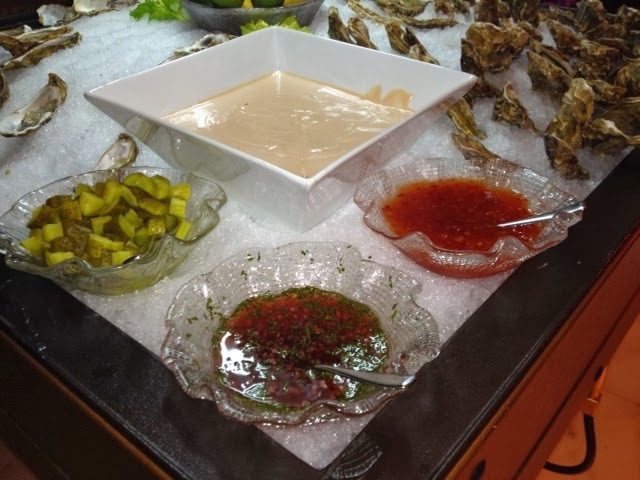 I started with the oysters. I was truly satisfied. With the exception of one that tasted a bit grainy with too much sediment, the others were fine advertisements for this most exquisite of delights. The mignonette I had to accompany them, neutralised the already not too-saltiness rather nicely. I then tried the sashimi which too was lovely: fresh and at the perfect temperature. I still would like to see restaurants move beyond the usual tuna and salmon choices that one finds. White fish (Shiromi) and cuttlefish (Ika) are easily prepared options and sets the sushi platter apart from the rest. The calamari was classic: chewy but not overly so. I had it with a bit of dry chili. Superb. The one disappointment all night for me was the lobster. 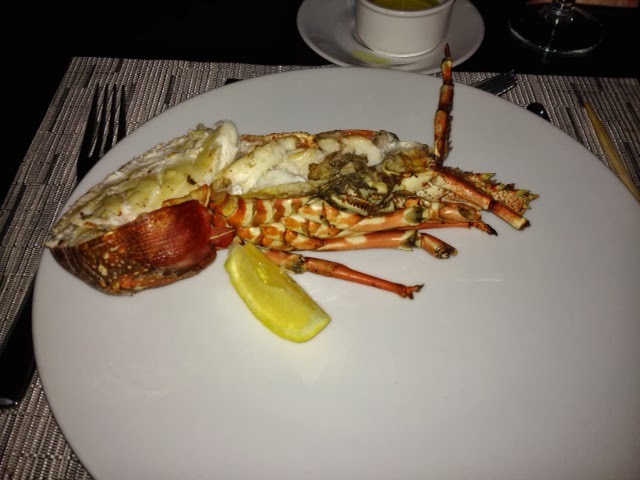 My friend waxed lyrical about his, claiming it was the best lobster he had ever had. Mine, though, was dry. This is the problem when you have more than one person grilling the lobster - you are never going to get consistency. I would rather wait a bit longer knowing my lobster was being prepared by the best hands they had. Finally dessert. 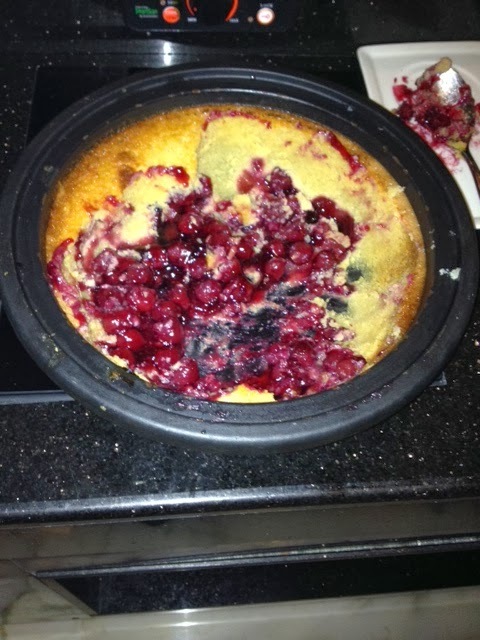 Do I have to mention anything but the unbelievably delicious cherry clafoutis? For those not in the know, this is classic French dessert of black cherries covered in a flan-like batter. 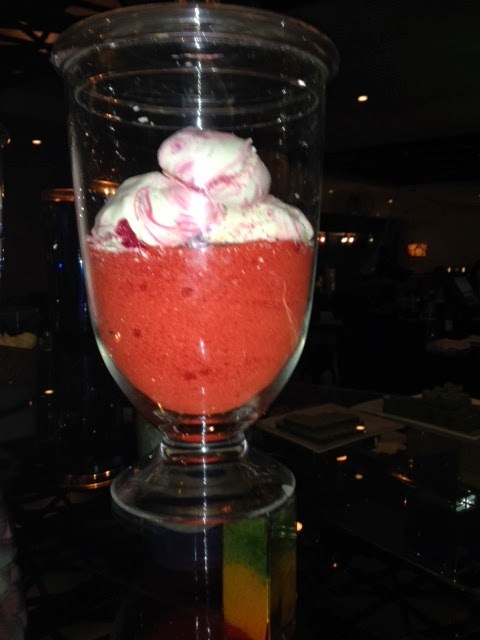 No, I will not mention the fabulous meringues. Nor the fine selection of petit fours. Of course I will not mention the cheese selection. And neither will I talk about the fresh fruit available. If you have one dessert, make it this bowl of cherry joy! The cherries are perfect: ripe with a gorgeous balance between sweet and sour, and not soggy, yet they almost melt in your mouth. Oh, I need to go back there! The dessert to stop all desserts: cherry clafoutis. Finally, service is very good. Visible but not overbearing. One small but niggling thing: why does one have to ask for cutlery once plates are cleared? One would like the meal experience to be seamless. This is a small matter that can be easily addressed, though. To sum up, a very impressive theme night. There is a variety of high quality dishes, all offered at tremendous value for money in a sophisticated but relaxed setting. 220 Dhs per person including soft drinks.